The various features in this new editor create a seamless experience for querying your database. Before executing queries against your database, you must login with either your SQL server or Azure Active Directory (AAD) credentials. 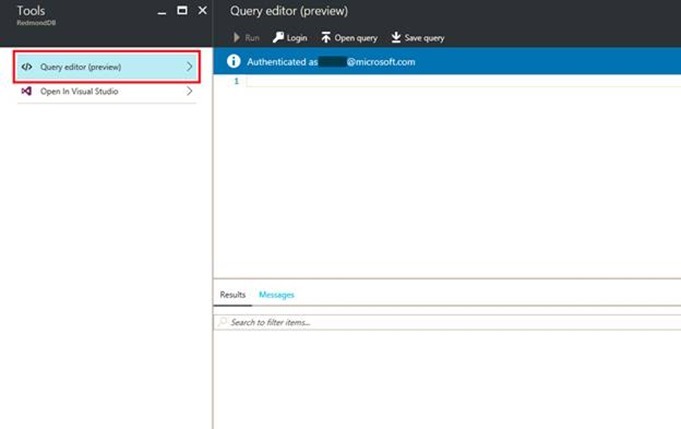 If you are the AAD admin for this SQL server, you will be automatically logged in when you first open the Query Editor using AAD single sign-on. Learn more about how to configure your AAD server admin. If you are not currently taking advantage of Azure Active Directory, you can learn more. 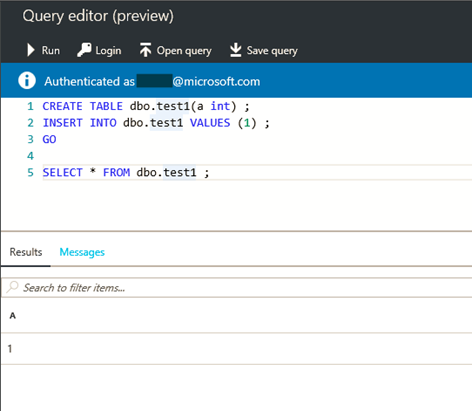 If you are already familiar with writing queries in SSMS, you will feel right at home in the in-browser Query Editor. Many common queries can be run in this editor, such as create new table, display table data, edit table data, create a stored procedure, or drop table. You have the flexibility to execute partial queries or batch queries in this editor. And by utilizing syntax highlighting and error indicating, this editor makes writing scripts a breeze. Additionally, you can easily load an existing query file into the Query Editor or save your current script in this editor to your local machine. This ability provides you the convenience to save and port the queries between editors. Another similarity between this Query Editor and SSMS is the ability to resize the Results pane to get the desired ratio between the Editor and Results sections. You can also filter results by keyword rather than having to scroll through all the output. You can find this experience by navigating to your SQL database and clicking the Tools command and then clicking Query Editor (preview), as shown in the screenshots below. While this feature is in public preview, you will need to accept the preview terms before using the editor. You can find this experience by navigating to your SQL data warehouse and clicking on Query Editor (preview), shown in the screenshot below. While this feature is in public preview, you will need to accept the preview terms before using the editor. You can quickly test out the editor by running a simple query, such as in the screenshot below. Please reach out to us with feedback at sqlqueryfeedback@microsoft.com.